Patriarch Moran Mor Bechara Boutros al-Rahi (or Raï; Arabic: بشارة بطرس الراعي‎, translit. Mor Bishārah Buṭrus al-Rāʿī; Latin: Béchara Petrus Raï) (born on 25 February 1940) is the 77th Maronite Patriarch of Antioch, and head of the Maronite Church, a position he has held since 15 March 2011, succeeding Patriarch Nasrallah Boutros Sfeir. Rahi was made a cardinal on 24 November 2012 by Pope Benedict XVI. Mar Bechara Boutros al-Rahi was born in Himlaya, Matn District, Lebanon on 25 February 1940. He attended Collège Notre Dame de Jamhour, a Jesuit school in Lebanon. He entered the Mariamite Maronite Order on 31 July 1962 and was ordained as a priest on 3 September 1967. [better source needed] From 1967 to 1975 he was responsible for the Arabic programs of Vatican Radio. In 1975, he received a PhD in canon and civil law. He also studied for three years at Lateran University in Rome. At 71, he was elected patriarch of the Maronites on 15 March 2011, after getting more than two-thirds of the votes of the 39 bishops and replacing Nasrallah Sfeir. The new patriarch formally requested and received ecclesiastical communion from Pope Benedict XVI on 24 March 2011 pursuant to Canon 76 § 2 of the Code of Canons of the Eastern Churches. The Mass for the inauguration of his Patriarchate took place on 25 March 2011, in Bkerké, the see of the Maronite Catholic Patriarchate. As is customary for all Maronite Patriarchs, Patriarch al-Rahi took the additional name Boutros, that of Saint Peter, who briefly held the See of Antioch before moving to Rome to become Bishop there. On 7 March 2012, Patriarch al-Rahi was appointed a member of the Congregation for the Oriental Churches. On March 18, 2015 Cardinal-Patriarch al-Rahi became the sole cardinal-elector from the order of cardinal-bishops when Cardinal Naguib turned 80 and ceased to be a cardinal-elector. He remained the sole cardinal-bishop elector until June 28, 2018 when four Latin church cardinal-priests of voting age were elevated by Pope Francis to cardinal-bishop by having their titular churches co-opted to suburbicarian rank. and Louis Raphaël I Sako, Patriarch of the Chaldean Catholic Church was created a cardinal-patriarch. In April 2011, Rahi said that, for the sake of communion and love, he would work "to establish a sincere and complete dialogue" with Muslims "and build together a future in common life and cooperation." He said his predecessor "struggled with insistence to free both the national decision-making and the land of Lebanon from all forms of tutelage and occupation, worked for reconciliation in Mount Lebanon and realized needed church reforms. All of these constitute an extension of the church's springtime started by the Second Vatican Council." Patriarch Rai does not use the term "Arab Spring", but "Arab Winter" to express his unenthusiastic reaction. In September 2011, some of the Christian supporters of the March 14 alliance were upset over his controversial comments in Paris, France where he supported Hezbollah's right to hold arms in defense against Israel, and stated that the 2011 Syrian protests could awaken the rise of the Muslim Brotherhood if President Bashar al-Assad was removed from office. March 14 supporters stressed how his predecessor had very different views and was almost fanatically supportive of the Lebanese Forces. Christian supporters of the March 8 alliance welcomed his comments. Prime Minister Najib Mikati also supported his stance saying "The Maronite patriarch spoke about a part [of the problem]. No one is against the resistance’s arms as long as Israeli occupation continues. There is Lebanese unanimity on the resistance’s arms in the face of Israeli occupation." Mikati said after his meeting with al-Rahi that he was "very relieved and reassured by the Patriarch’s wisdom." President Michel Suleiman said that "the Patriarch is not in need of anyone to defend him and his positions emanate from his central role as a person in charge of Lebanon's and the Middle East's Christians and that of Lebanon's independence and sovereignty;" and that "the patriarch does not need to be defended, and his stances represent his way of taking responsibility for Lebanon's Christians." Parliament speaker Nabih Berri said that Rai's "comments in Paris protect Lebanon from danger and I agree with what he stated and affirm his vision that is rooted in both a religious and national background" and that "If the situation further deteriorated in Syria and we reached a more radical rule than the current rule, like the rule of the Muslim Brotherhood, Christians there would pay the price, either in the form of killings or displacement. Here is the picture of Iraq in front of us." Free Patriotic Movement leader Michel Aoun expressed support for al-Rahi: "Rai’s statements express the concerns of the minorities because he is entrusted with the Synod for the Middle East. Gradual changes doesn’t harm stability and wouldn’t get Syria into the [same] troubles as Palestine, Iraq, Libya and Yemen. [As some of the Syrian demonstrators are armed and are destroying the country] the Syrian government cannot but bring order to the country." Former 14 March Progressive Socialist Party leader Walid Jumblatt also criticised Rai's assessment on the grounds that "Lebanon cannot remain hostage to regional conflicts", and denied that regime change in Syria was posing a threat to Christians in the country. In an interview with Reuters on 4 March 2012, al-Rahi said: "All regimes in the Arab world have Islam as a state religion, except for Syria. It stands out for not saying it is an Islamic state...The closest thing to democracy [in the Arab world] is Syria." On May 26, 2014, the patriarch decided to join Pope Francis on parts of the pontifical three-day Holy Land pilgrimage. The Maronite patriarch arrived late Sunday in Jerusalem after accompanying Francis in the West Bank, but he departed from the parts of the Catholic leader's itinerary that involved meetings with Israeli officials. After visiting a monastery outside the city on his way to Jaffa, Rai joined the pope again in the afternoon for Mass at Jerusalem's Cenacle. The patriarch then returned to the West Bank for a visit to Beit Sahour, toured the north, the Galilee region, Nazareth, Acre and Haifa, where many of the country's Arab Christian minority live. The visit was criticized at home. The patriarch maintained that he was misunderstood and that his journey was celebrating the roots of Christianity in the region. Patriarch Raï, at Chair of Saint Peter, last 11 October 2014. Patriarch Rahi lays on his hands to father Maurizio Malvestiti during his episcopal ordination. Behind them, the cardinals Sandri and Müller, 11 October 2014. ^ A tabieh (طابية) and an escime (إسكيم). ^ The first two Maronite Cardinals Paul Peter Meouchi (made cardinal by Pope Paul VI) and Anthony Peter Khoraish (created cardinal by Pope John Paul II) turned 80 and died before having an opportunity to participate in a conclave and the third Maronite Patriarch to become a cardinal, Nasrallah Boutros Sfeir was over the age of 80 during the 2005 sede vacante and thus did not take part in that year's conclave. ^ a b "Bishop Bechara Rahi". Facebook. Retrieved 15 March 2011. ^ "Mons. Béchara Raï". Vatican Radio. Archived from the original on 27 July 2011. Retrieved 16 March 2011. ^ Malek el Khazen. "Election of the Maronite Patriach history". Khazen. Retrieved 19 March 2011. ^ "Béchara Boutros Cardinal Raï, O.M.M." Catholic-Hierarchy.org. David M. Cheney. Retrieved 23 January 2015. ^ "Naharnet — Lebanon's leading news destination". Retrieved 10 January 2017. ^ Richards, George (11 March 2013). "An Arab pope?". Daily News Egypt. Retrieved 14 March 2013. ^ "Code of Canons of Oriental Churchs Canon 76 §2". Retrieved 5 September 2014. ^ "Letter of His Holiness Benedict XVI to His Beatitude Béchara Boutros Raï, Patriarch of Antioch for Maronites Accepting His Request for Ecclesiastical Communion". Vatican.va. 24 March 2011. Archived from the original on 18 March 2013. Retrieved 5 September 2014. ^ "Rinunce e nomine". Catholica. Archived from the original on 25 September 2013. Retrieved 6 March 2013. ^ "Annuncio di Concistoro per la Creazione di Sei Nuovi Cardinali". Holy See Press Office (in Italian). 24 October 2012. Archived from the original on 23 February 2013. ^ "Rinunce e nomine". Catholica. Archived from the original on 9 February 2013. Retrieved 6 March 2013. ^ "No Arab in the running for Pope, but Maronite to get vote for first time". Albawaba News. 12 February 2013. Retrieved 20 August 2013. ^ D'Emilio, Frances (28 June 2018). "Pope, making new cardinals, hears Iraqi tell of martyrs". Fox News. Associated Press. Retrieved 29 June 2018. ^ "Maronite patriarch pledges to work with Muslims". 28 March 2011. Retrieved 10 January 2017. ^ Khashan, Hilal (Summer 2012). "Lebanon's Shiite-Maronite Alliance of Hypocrisy" (PDF). Middle East Quarterly: 79–85. Retrieved 20 March 2013. ^ "Rai defends stance on Syria, weapons". 12 September 2011. Retrieved 10 January 2017. ^ "Mikati reassured after meeting with Rai". Retrieved 10 January 2017. ^ iloubnan.info. "Lebanon's news portal - iloubnan.info". Retrieved 10 January 2017. ^ "Suleiman said Rai doesn't need to be defended". Retrieved 10 January 2017. ^ "Berri: Rai's views on Syria help protect Lebanon". 10 September 2011. Retrieved 10 January 2017. ^ "Aoun: Assad will not fall, Hariri at fault on maritime debacle". 21 September 2011. Retrieved 10 January 2017. ^ "Rai's words draw Jumblatt's ire". 13 September 2011. Retrieved 10 January 2017. ^ Michael Stott; Samia Nakhoul (4 March 2012). "Violence turning Arab Spring into winter". Reuters. Bkirki, Lebanon. Archived from the original on 5 March 2012. Retrieved 5 March 2012. 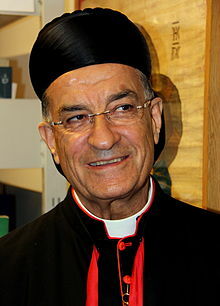 ^ "Lebanese Maronite Patriarch Visits Israel, First Since 1948". Haaretz. 26 May 2014. ^ "Suite de la visite en France du patriarche maronite". La-Croix (in French). 6 March 2013. Wikimedia Commons has media related to Bechara Boutros al-Rahi. "Raï Card. Béchara Boutros, O.M.M." Holy See Press Office. Archived from the original on 29 July 2017. Retrieved 25 October 2017. "Maronite Patriarch Béchara Raï Elected". Zenit. 18 March 2011. Retrieved 24 October 2017.